Why petrol is unlikely to escape the GST posted to The Star on 27th September 2014. NOW that the Pengkalan Kubor by-election is over, the touchy issue of petrol being subjected to the goods and services tax (GST) will probably see some credible discussion. At the heart of the matter is the growing call for petrol to be zero-rated under the GST so that there is no tax imposed on the commodity. The logic is that if petrol were to be imposed a GST of 6%, it would trigger a chain of price increases for consumers and, ultimately, a higher inflation rate. Government officials, except for a rare comment here and there, have shied away from talking about the GST being imposed on petrol, fearing that it would be politicised. So, when there is a heated discussion on petrol and the GST, the official answer is that a statement would be released on the matter in due course. But closer scrutiny suggests that it is highly unlikely that the Government would classify petrol as an item that is zero-rated under the GST. In many other countries where there is GST or VAT including our closest neighbours Singapore, Thailand and Indonesia, petrol is subject to GST. It is of no suprise here that it will highly likely be so in Malaysia. Firstly, petrol is already an item that is highly subsidised. What is the point of imposing the GST on a subsidised product? Secondly, there is already a sales tax of 58 sen per litre on petrol being sold at the pump. But the Government does not collect this amount because the total subsidy per litre far outweighs the sales tax. The amount the Government subsidises per litre depends on the global price of crude oil. Based on previous reports, the subsidy was estimated at 70 sen per litre when crude oil was more than US$115 (RM374) per barrel. Global crude oil prices have over the past two months been hovering at less than US$100 per barrel. This is despite the war in the Middle East and the confrontation between Russia and the United States and Europe. Experts are predicting that the outlook for global oil prices will remain subdued for some time to come, unlike previously where any sign of conflict would cause oil prices to flare up. Because Petronas is contributing 20% (as of 2012) to our national coffers coupled with weakening oil prices, all the more reason to reduce subsidies and subject petrol to GST to compensate for revenue loss from falling prices. Pandan MP Rafizi Ramli estimated that Putrajaya could collect a revenue of at least RM3 billion in GST from fuel and diesel a year, and this will form between 12% and 14% of the total GST collection. Now the advancement in technology to produce shale gas has changed the dynamics of the oil and gas supply-demand situation. The production of shale gas has changed the supply-demand situation in global crude oil prices, too. On top of shale gas taking away some market share from the traditional crude oil, the global economy as a whole is showing signs of weakness. In this respect, the economies of China and Europe are weak. Assuming the experts are right and the global oil price remains subdued, it should mean that the Government subsidy bill for petrol will keep reducing. When crude oil is trading at a band of between US$75 and US$85 per barrel, the Government no longer has to bear any subsidy for petrol at the pumps. 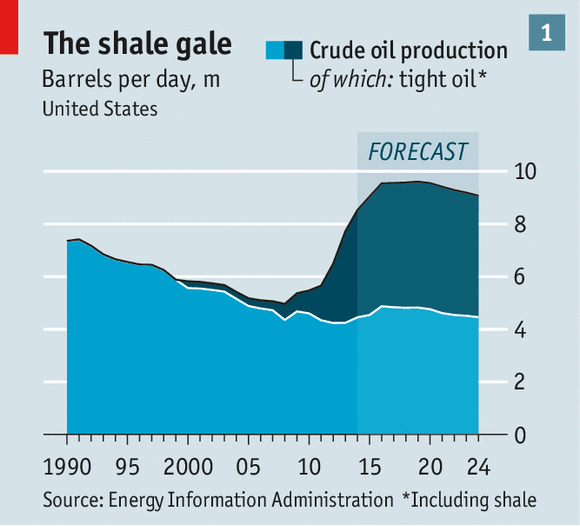 This is quite possible as the shale oil revolution is underway and has yet to peak. And below is just the United States (world's largest reserves). There are many other countries with large reserves hoping on the same wagon. During the crisis in 2008, when crude oil prices fell below US$80 per barrel, the Government collected millions in revenue from the sales tax. Considering the dynamics in the oil price situation, why would the Government classify petrol as a zero-rated item under the GST? Petrol, after all, is a controlled price item. By making it a zero-rated item, the Government would lose its flexibility to impose a 6% tax should the global oil price fall below the US$75 to US$85 range, where there is no longer any subsidy and the 58-sen-per-litre sales tax mode kicks in. As for consumers, because the GST is a consumption-based tax and the price of petrol is fixed, whether it is zero-rated or otherwise may not have much of an impact. The more the consumers use, the more they pay. Here's the bad news. Consumers have not much of choice as public transport is poor. There is simply no alternative to the alternative. It would cost me RM8 for fares and 3.5 hours of travel per day if I would use public transport from home-work-home. Not acceptable. For the rural and urban poor, the bigger problem is housing and employment. For businesses, when there is a GST, the petrol expenses are part of their input tax that can be claimed back. So, technically, they should not complain. They wouldn't complain, they would simply pass the burden to consumers because every business owner will do so. Lastly, if petrol is zero-rated, would the pump operators pass on any savings in expenses to the consumer? This is highly unlikely. Also, if petrol is listed as a zero-rated item now, it would be a difficult task and politically explosive to take it out of the list should there no longer be any subsidy on the item. Therefore, everything points to petrol being a GST item.